During many years I worked closely with travellers looking for a dream destination to spend their honeymoon. Of course there are as many different attributes for a honeymoon as there are wedding couples, but based on my experiences I would say that 80% of all the honeymoon requests include the following three elements: Crystal clear turquoise waters, white sand beaches and palm trees. Simple, isn’t it? Well once the requirements related with the natural setting has been full filled the next question coming up is often related with the accommodation. First of all it has to be private, preferably a villa or bungalow type of accommodation with a private pool if possible. Secondly the standard of the facilities and the services has to be high and offer something special for honeymooners, like welcome champagne, free candle light dinner…or at least some rose petals over the bed or the bath. I used to ask myself what makes honeymoon so special then? Why is it different from the other trips and why people have so many expectations on it? Sometimes it sounds a like a very stressful thing to be organized, as each and every moment of it has to be more than perfect. However I do agree that the stress over the honeymoon is morely likely to happen during the preparations. Once you reach the destination with your spouse, get accommodated in your bungalow, step on that white sand beach and see how the palm trees sway in the breeze all the stress you had suddenly disappears. Well, why am I writing about honeymoon requirements then? Simply because Brazil has several destination fullfilling these expectations, and we would like to give you some tips where to spend your dream honeymoon in Brazil. As there are as many ways to spend the honeymoon as there are couples, we haver listed below some possible honeymoon destinations with short description. Among the top tree honeymoon destination in Brazil are certainly is the island of Fernando de Noronha, the southern coats of Bahia and the well developed region of Porto de Galinhas with large variety of accommodation option. Why these three then? First of all Fernando de Noronha is a destination for a lover of nature and virgin beaches, which should always be the main reason when planning a trip to Noronha. The beauty and the pureness of the island are indescribable, sinceraly there must not be too many places where the conservation of the nature has been so well done as in Fernando de Noronha. Here you will be accommodated in a small pousada, whether the nivel is luxurious or raither cozy with personalized treatment, it’s up to your personal choice. 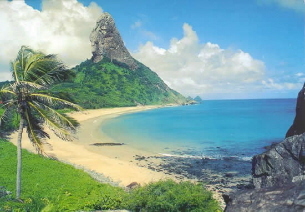 Fernando de Noronha is a once in a life time experience! 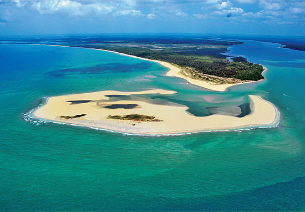 The region of Porto de Galinhas has a large infraestructure when it comes to tourism. The large variety of accommodation options will guarantee the fact that during your honeymoon you will be accommodated exactly in the kind room, villa or bungalow as you wish. Here you will find bungalows with private pool, stressless all inclusive hotels and large range of other services and activities without forgetting the beautiful natural settings of this coast with plenty of white sand beaches and palm trees. Do you want to pamper yourself during your honeymoon, go to Porto de Galinhas! Last, but definitely not least the southern coast of Bahia. I could bet that among the Brazilians themselves, such destinations as Arrail d’Ajuda, Trancoso and Maraú in the southern coast of Bahia are probably the top destinations when spending their honeymoon in Brazil. These destinations are real hideaways with magnificant nature, seducing beaches and lush vegetation. Here you will find some very luxurious, but still intime accommodation options, where you will be able to a the most romantic honeymoon ever. 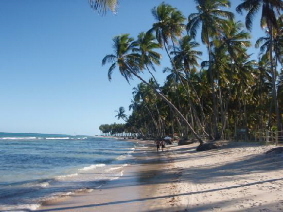 The southern Bahia is a place to relax and simply enjoy the pure harmony and tranquily of the region. These are just three examples of perfect honeymoon destinations, of course Brazil has a lot more to offer and like I mentioned earlier it’s all up to your personal choice. Some may prefer a city break in the marvellous city of Rio de Janeiro combined with a beach extention in chic Búzios or tropical island of Ilha Grande, others may prefer adventures in the Amazon…Whatever it is, you will find it in Brazil! Why to travel to Brazil? A recent research revealed what the foreign travellers most appreciate in Brazil. The top four included several facts related with the nature, but the interesting point in fact is the first position. People, was stated by most of the travellers and therefore stands at the number one position. People – Having people at the top of the list is an honour for any country. This means that the hospitality and the joy of brazilians is clearly visible for tourists visiting the country. In general the life has an easy-going rhythm and brazilians interact gladly with the foreigners. Here you will not stay at closed resort, but get mixed with the people and enjoy the same things as the brazilians do. I wonder if there is any other place on the earth where the joy of life is as visible as it is in Brazil. There may be many people with less conditions, but most of the will never lose their faith or the joy of life. If you come from a country with high level of self service you will also find it marvellous to be fully served at the stores, bars and restaurants, and still you will not face disturbingly persisting sellers on the streets or at the beach. The beauty of the nature – I would say that the second postition should be the beauty and the variety of the nature. As a huge country Brazil has an incredible variety of eco-systems depending on the part of the country. The beauty of the nature consists of numerous beaches, tropical vegetation, dunes, canyons, rainforest, waterfall, mountains, lagoons, lakes and rivers. There are extremely dry areas in Brazil and on the other hand a large part of the country is covered by rainforest. For sure the nature of this country offers something for each and every traveller, the question is do you really know all that Brazil has to offer? Beaches and the sea – Brazil has long coast with large number of beautiful beaches, some of the ideal for surfing, others for diving or snorkeling and almost all of them perfect for sunbathing and swimming. It’s not long time ago that I read an interesting review related to tourism in Brazil. The author said that Brazil may not have the most beautiful beaches of the world, compared to Southern Pacific of Maldives for example, but Brazil certainly has the funniest beaches of the world. After having travelled widely around the world, I have to agree with the author of this article, Brazil definitely has the funniest beaches of the world and the best point is that many of them are among the most attracting ones as well. In Brazil beaches are like living-rooms, going to the beach is part of the culture and the daily life of brazilians. Here beaches are public and legally an access to any of them cannot be denied. This is why the coast of Brazil is not filled with resorts with private beaches, where only the clients can have an accesss. To be sincere, I think that is something Brazil should be proud of and this is why there is no other beach life like in Brazil. Being in the beach with the brazilians, you will quickly realize why people are in the top one position of the research. The joy of life is visible everywhere and there is always a beach bar to serve you whenever you are thirsty or hungry. Tropical climate – Thanks to the geographical position of Brazil, almost the whole country has tropical climate. This means that sunshine is basically guaranteed at any time of the year, at least in some part of the country. That’s why there are two basic things you should pay attention to before booking your trip to Brazil. First of all, if you have decided to travel during a specific time check out the climatical conditions in different parts of Brazil and choose your destination based on that. On the other hand, if you always wanted to visit certain area check out when is the best season to travel there, or at least when visiting those places is not recommendable and schedule your trip according to that. Right after that you are ready to enjoy the tropical climate and the sun shine of Brazil! Salvador, the state capital of Bahia, was also the first capital of Brazilian Republic and even today is the city with most african influence. Salvador is also the third biggest city of the country, right after São Paulo and Rio de Janeiro and naturally its’ airport is among the busiest of northeastern part of Brazil. In Salvador you can easily feel the african roots of Brazilian culture, hear the rhythms, taste the flavours and feel the power of myths and such african religions as candomble. If you are looking for culture together with city life, Salvador is probably one of the most interesting brazilian cities to stop by. The main attraction of Salvador is the old town called Pelourinho, located in the upper part of the city, which belongs in the Unesco list of World Heritage sites. It’s dominated by colorful colonial style buildings, beautiful churches and lively streets. Here you will find plenty of charming restaurants, shops of local handcrafts, artists of all kind and “baianas“, the local ladies wearing traditional white dressing and often selling some delicacies. It’s not rare to find people practising capoeira or playing Afro-Brazilian rhythms on the street. It’s here, where samba-reggae was born and became famous thanks to well known Afro-Brazilian band Olodum. Up from the edge of Perlourinho you will also have beautiful view over the Baía de Todos os Santos bay and if you take an elevator down you will find yourself being in front of the Mercado Modelo market, an another excellent place to buy local handcrafts and souvenirs of Bahia. Salvador has another important historical spots as well, one of the most popular being the church of Bonfim. This church is a pilgrimage destination for the Brazilians, but is worth visiting for anybody who enjoys old architecture and history. To reach Bonfim, you can either take a regular bus leaving in front of Mercado Modelo or alternatively try the touristic Salvador Bahia Bus, which works on “hop on, hop off” basis and in addition to Bonfim takes you to many other interesting parts of the city with fixed daily price. If you choose regular bus, you better be prepared to longer travelling time, due to the number of stops and depending on the type of the bus, air conditioning may not be available either. Just like in Rio de Janeiro, in Salvador organized tours to favela (=slum) can also be found. Part of the tour fee usually goes in the education or in the improvement of the living conditions of the favela inhabitants, so therefore the tours are not only a safe way to visit favela, but also a great way to make this world a better place for everybody. When choosing your neighborhood in Salvador we would recommend you to stay either in Pelourinho, Barra or Rio Vermelho. In Pelourinho you will find some charming old building that were refurbished to serve as hotels and has turned out to be an excellent place to spend overnight. Another good options to stay are the neighborhoods of Barra and Rio Vermelho, both just a short drive away from Pelourinho with large variety of accommodation options for all budget and several restaurants and bars for dining as well. The carnival of Rio de Janeiro may be world widely more famous than the carnival of Bahia, but in fact the carnival of Salvador is the world’s biggest street party and attract a countless number of participants to celebrate in the streets of Salvador. Definetely something you should consider about, if you are into carnivals! Many tourists travel to Bahia planning to stay at one of the stunning beaches of the state, but once you are in Salvador make sure you stop there at least for two or three nights. Salvador is worth stopping and after having explored Pelourinho, we are sure that you are not regretting at all. We recommed you to combine Salvador with some of the many beach or eco-tourism destination located close by. Casa do Amarelinho – A small hotel located in refurbished building in the heart of Pelourinho. Excellent level of service with special charm and all the amenities you might be expecting. Catharina Paraguacu – A good tourist class hotel located at Rio Vermelho. Catharina Paraguacu offers you an intimate stay in an old style building surrounded by gardens. Restaurante O Nilo – An excellent restaurant serving arab food in a peaceful corner of Pelourinho. O Nilo has tables both inside and outside, but does not accept credit cards. Brazil Diversity is now at Twitter! Brazil Diversity is now publishing the latest news and travelling tips at Twitter. Receive the latest news of Brazilian tourism, discover our recommendations and find out the hottest destinations of this diverse country. Follow Brazil Diversity at Twitter! Welcome to follow Brazil Diversity! Travel around the globe, stop in Brazil and be with us – it’s all about Diversity!